Hi friends! I wanted to take a moment to say hi to my old and new visitors… HI!!! Weeknite Meals is approaching it’s 200th posting, still can’t believe it’s only been a little over 2 years. My pet project of keeping up with recipes, and practice cooking techniques has turned into a place of friendship. I am thrilled with visitors from different parts of the world, it’s amazing how much we can learn, not just about food, but culture and kindness and encouragements in the food blogging community, thank you again for visiting! Due to the ridiculous gas prices and general sluggish economy, I try hard to grocery shop every other week. Last week we made the mistake of deciding to eat out and buy a bird feeder on Wednesday (we are in a losing battle with the vicious squirrels), the meal was around $20 (which is reasonable), but everyone knows going to Super Target for 1 item, you will end up pushing a whole cart of stuff home… So that’s exactly what happened to us… After that trip I’ve decided to get even more diligent about not eating out during the week, if we stay in the neighborhood, after dinner there’s actually time to take a nice stroll and get some exercise in, surely beats spending $100 on crap we didn’t need in the first place right? OK, it’s time to share this simple and flavorful recipe. Hubby planted some lemon grass in the backyard for me, their stalks are not as thick as the ones from the market, but they are fragrant, and apparently mosquitoes hate the smell, so we are killing 2 birds with 1 stone here! If you don’t have access to lemon grass, just use some more garlic and herbs of yours choice, I am sure the sauce will turn out yummy anyway! Heat oil in wok, stir fry chicken over medium high heat, until brown. Add cooking sauce, stir for another 1 minute. Stir in onion, basil and coconut juice, cook for about 2 minutes, turn down heat and simmer for 5 minutes to cook down the sauce. Serve over white rice. Enjoy! Hi Nami, can’t wait to see your Lemon Grass Chicken posting! Yes Jon planted lemongrass in the backyard, in a big wine barrel, I like that they repel bugs, taste good, and are nice to look at! I really need him to plant some sweet basil. sure beats spending $4 at the market every other week! Hi Lyn! Long time no talk, hope you are doing well! I am only at the 197 posting right now, definitely looking for something special for the 200th entry! I’ve actually never tasted lemongrass until hubby and I started dating. Before I met him we stuck to eating mostly my Mom’s food, and Chinese recipes do not call for lemongrass, so the first time I tasted it, I was mesmerized! Hope your family will enjoy the recipe! 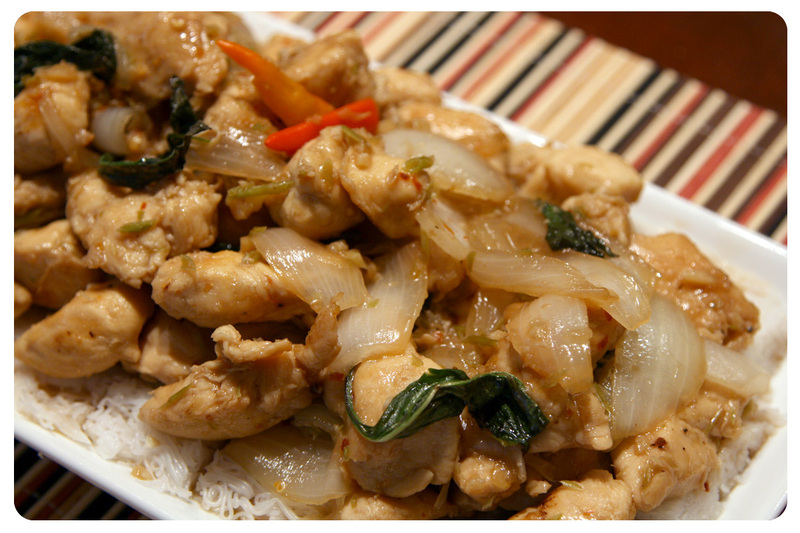 Your Chicken with lemongrass sound perfect for any day of the week meal. Love the idea, and my kids would enjoy this too. Thank you for sharing and have a lovely day! Hi Sandra! Hahaha, glad to know I am not the only person who gets tricked by Super Target every time! Hope your family will enjoy the recipe, hubby did say it was a bit salty, but little girl and I really enjoyed it! Congratulations, Jeno! 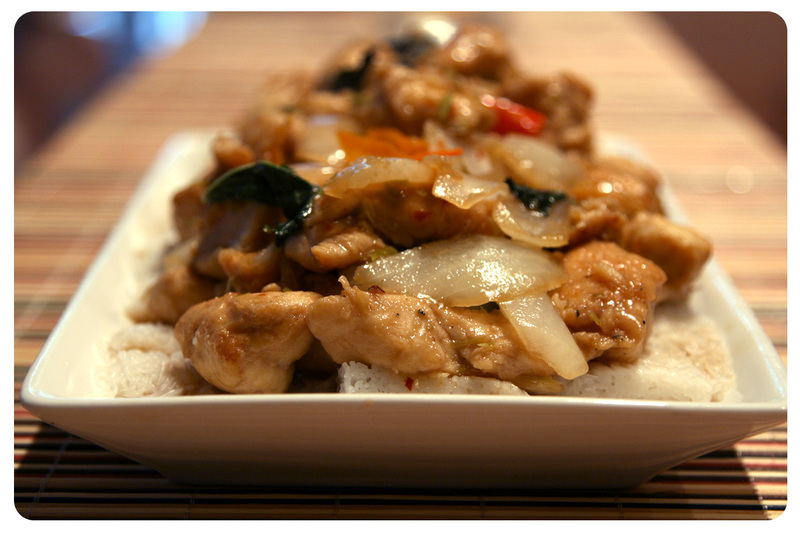 Your lemongrass chicken sounds fantastic! I always keep lemongrass in the freezer (it’s the best freezing condiment I know!) and love using it in soups and sauces. I have been thinking about you today because I wanted to make your lemon chicken once more and found I had only limes in the fridge. I desperately wanted lemons so finally have made something else. I will try finding lemongrass seeds. (I hope they grow from seeds…). It would be great to have it on my balcony. Actually I bought two years ago something called “lemongrass seeds” but on the photo it looked like… grass 😉 and I have never managed to make it grow… I’m sure it was a different plant. Hi Sissi! I always love reading your comments! I used to put unused lemongrass in the freezer also, but there’s no need now since there are plenty of fresh ones in the backyard. It’s funny you mentioned the lemon chicken, cause I was contemplating whether to make that with the chicken tenders, but lemon grass won me over! Jeno, thank you so much for the kind compliment. I am so happy my comments don’t bore you… I also appreciate yours a lot and our conversations through our mutual blogs always make me happy. Communicating and exchanging in this way is my favourite part of blogging (apart from trying our mutual recipes of course!). Thank you so much for the tip! I have now some stalks in the fridge (not freezer only) and guess what I’m doing in a minute! I will try your magic growing method! I will keep you informed about my lemongrass growing process. Thanks again! Sissi, you are too kind! Though I really do love the encouragement and kindness food bloggers show each other, it’s a wonderful community! Can’t wait to hear how your lemongrass growing experiment turns out, good luck! Thank you for sharing this easy recipe. 🙂 I love that I pretty much have all the ingredients in my kitchen, aside from the lemongrass and basil. I wish I could grow lemongrass where I live but unfortunately , it’s too foggy. Hi Candice! If you can get your hands on a few stalks of lemongrass, this link might be helpful with growing your own lemongrass (http://purplefoodie.com/grow-your-own-lemongrass/). I am in need of good sweet basil also, last Spring and Summer we have a HUGE container of them, I was so spoiled and didn’t realize I had it good. Need to make a mental note to plant some again! Good luck! Hi Kankana! Thank you! I actually just had some left over chicken for lunch, still yummy! This chicken dish looks so delicious, Jeno! I love the simple, fresh and flavorful ingredients you used in it, too. I’ve never made anything like it before but I’d love to try it! Thanks for sharing. Have a happy weekend with your family! Thank you Georgia! I think the Texas weather is perfect for planting lemon grass, hope you will like the dish if you do give it a try. Have a good weekend! Hi Jeno! This looks just delicious. I don’t use lemongrass AT ALL, and I’m feeling left out! I adore lemon and garlic roast chicken, so I really must try lemongrass. It looks such a simple recipe, too. Absolutely yummy! Hi Jenny! I figured a lot of people probably have not given lemon grass a try, lord knows I didn’t know about them until a few years back… Even if you don’t have access to lemon grass, I think lemon and garlic would work just as well with this recipe, sounds real yummy! Hi Cindy, congratulations on your 200th post! It’s amazing that you have managed to produce 100 posts a year while working and taking care of your daughter! Coincidentally (another coincidence besides Nami’s) I also talked about home grown vegetables in my post this week but I am super jealous of your home grown lemongrass. I am sure your chicken dish is extra tasty with the freshly picked lemongrass. Thanks for sharing! Hi Yi! I am actually just approaching 200th post, this was the 197th, still searching for a good recipe for the next few, keep your fingers crossed! I wanted to thank you for the kind words, blogging can be time consuming, though the upside is so wonderful (better cooking skills, money saved, and friendships made), I definitely want to keep up with it! Surely you can plant some lemongrass also (here is a helpful link: http://purplefoodie.com/grow-your-own-lemongrass/), I just recently pinned a post about growing green onions in water, will be giving that a try real soon! Grocery shopping is hard, especially when you live on a rather limited budget. 😕 It helps me to make lists so I know what I need and won’t buy a ton of other stuff. Hi Kath! I actually am kind of new when it comes to Vietnamese herbs, lemongrass is very refreshing, hopefully it will work well with your diet. Making a shopping list is definitely a good idea when it comes to grocery shopping, the problem is I would strap away and pick up unnecessary crap, hopefully being more mindful with a budget will keep me in line!